The holidays are approaching, and I do get antsy planning out the family dinner. I try to rotate my recipes around the 4-5 traditional dishes everyone expects. My family doesn’t like the menu to be a surprise. They want the smells that are familiar to them and the anticipation of dessert with my freshly baked pumpkin pies. Here is one my favorite appetizers I make for Thanksgiving, that meets the approval of my family. I do make the filling the night before. Wash and dry the mushrooms and place them in a large plastic bag placed on a paper towel and flat in the refrigerator. 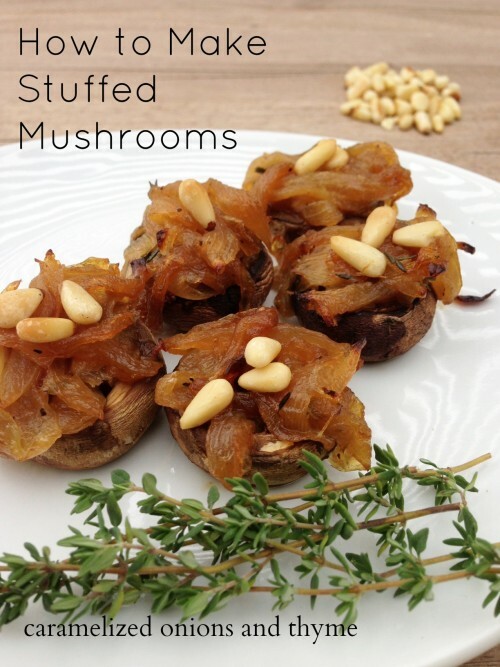 Early that morning I take out the mushrooms, fill them, and place them on a cookie sheet and bake into the refrigerator, ready to bake as company arrives. Start with your pan on medium-low and carefully watch and stir, this will take some time. Add the ingredients and just continue cooking. As you can see the onions need to turn medium brown to become caramelized and sweet. At this point you can transfer them to a bowl and refrigerate for the next day or use later on in the day. I use a combination of white button mushroom and baby portabello. will ensure a cooked mushroom. Do not over- stuff the mushrooms or they will be too are hard to handle. 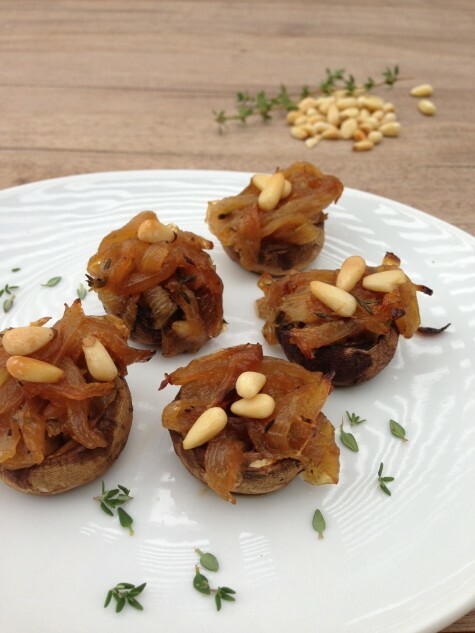 Perfect recipe for a quick and easy appetizer for any party. Change out the crunch with any nut of your choice, but don't leave it out. 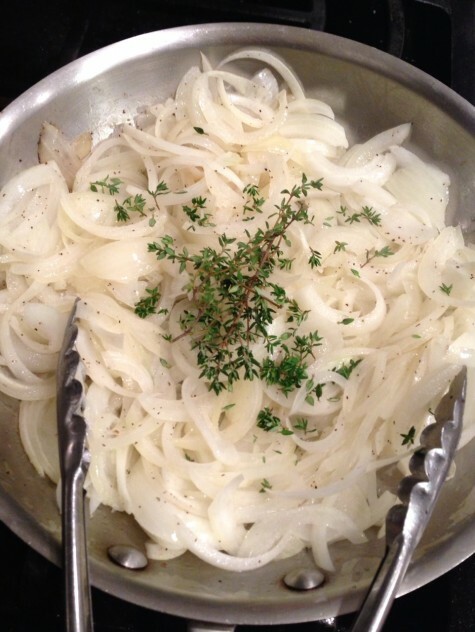 In a large skillet on medium heat add the butter and sliced onions. Add the thyme, salt and pepper to taste. Lower the heat to simmer and continue cooking until onions are golden for approximately 20-30 minutes. 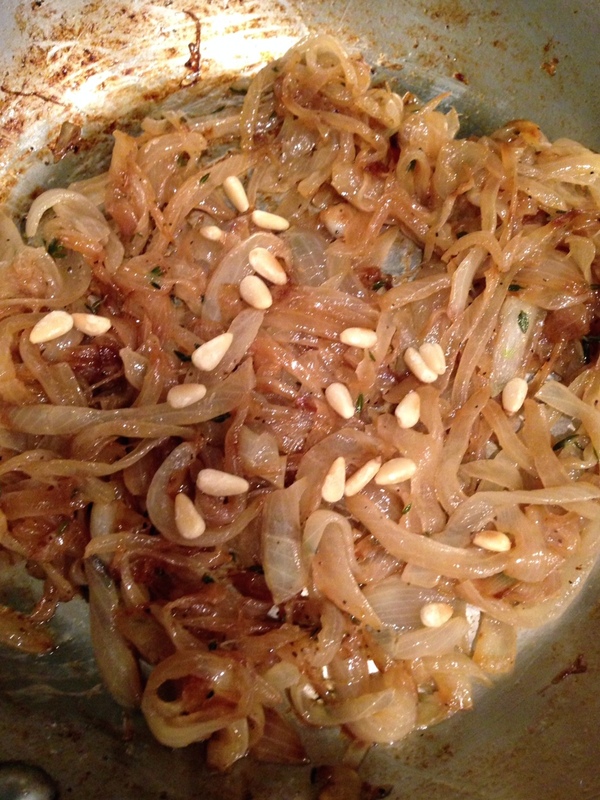 While cooking onions, place pine nuts in a small skillet and cook for 4-5 minutes until toasted. Stir toasted pine nuts into onion mixture. Rinse and dry the mushrooms. Place mushrooms caps, stem-side up on a baking sheet. Turn mushrooms stem side up. 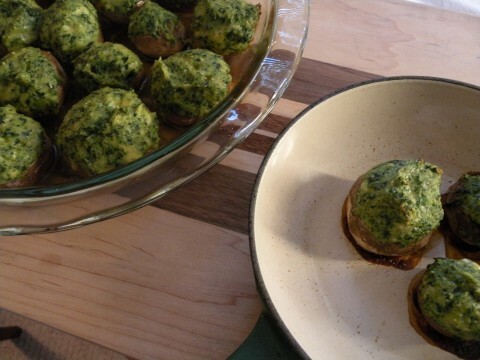 You may also like my spinach-stuffed mushrooms . Delicious! I am going to try these. Not sure what the family will think but know I will love them.